Video Indexer recently released a new and improved Video Indexer V2 API. This RESTful API supports both server-to-server and client-to-server communication and enables Video Indexer users to integrate video and audio insights easily into their application logic, unlocking new experiences and monetization opportunities. To make the integration even easier, we also added new Logic Apps and Flow connectors that are compatible with the new API. Using the new connectors, you can now set up custom workflows to effectively index and extract insights from a large amount of video and audio files, without writing a single line of code! Furthermore, using the connectors for your integration gives you better visibility on the health of your flow and an easy way to debug it. 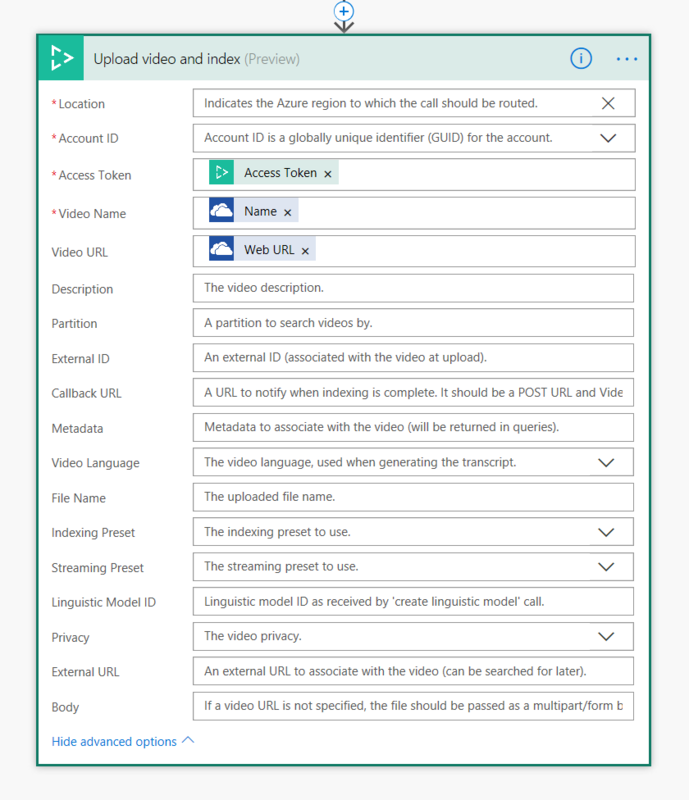 To help you get started quickly with the new connectors, we’ve added Microsoft Flow templates that use the new connectors to automate extraction of insights from videos. In this blog, we will walk you through those example templates. This scenario is comprised of two different flows that work together. The first flow is triggered when a new file is added to a designated folder in a OneDrive account. It uploads the new file to Video Indexer with a callback URL to send a notification once the indexing operation completes. The second flow is triggered based on the callback URL and saves the extracted insights back to a JSON file in OneDrive. The reason that two flows are used is to support async upload and indexing of larger files effectively. Navigate to the first template page. To set up this flow, you will need to provide your Video Indexer API Key and OneDrive credentials. Fill in your account Location and ID to get the Video Indexer account token and call the file upload request. For file upload, you can decide to use the default values, or click on the connector to add additional settings. Notice that you will leave the callback URL empty for now … you’ll add it only after finishing the second template, where the callback URL is created). Click “Save flow,” and let’s move on to configure the second flow, to extract the insights once the upload completed. Navigate to the second template page. 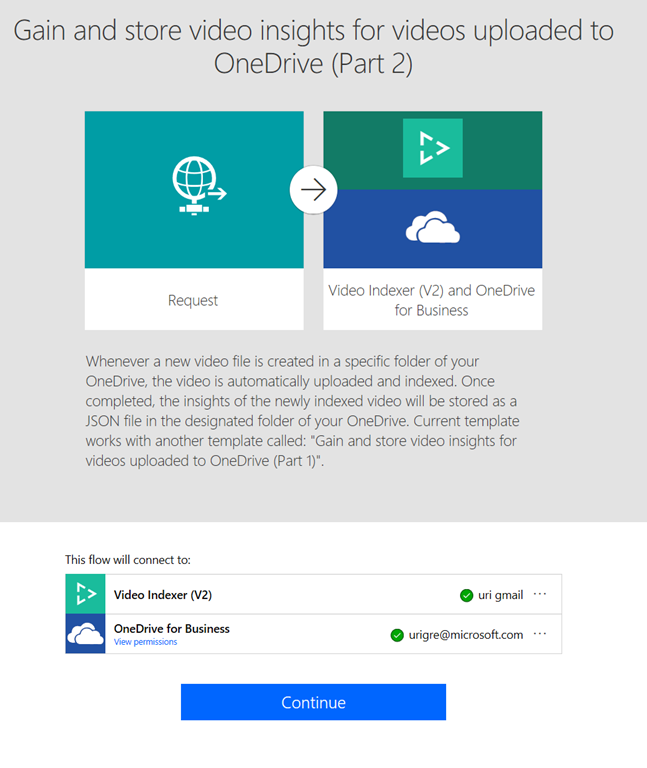 To set up this flow, you will need to provide your Video Indexer API Key and OneDrive credentials. You will need to update the same parameters as you did for the first flow. Then, continue to configure the flow. Fill in your account Location and ID to get your Video Indexer Account Token and the Indexing result. And select the OneDrive folder to save the insights to. You can also edit the default parameter, if you would like to change the name of the JSON file containing the insights. Make sure both templates are saved, and you’re good to go! 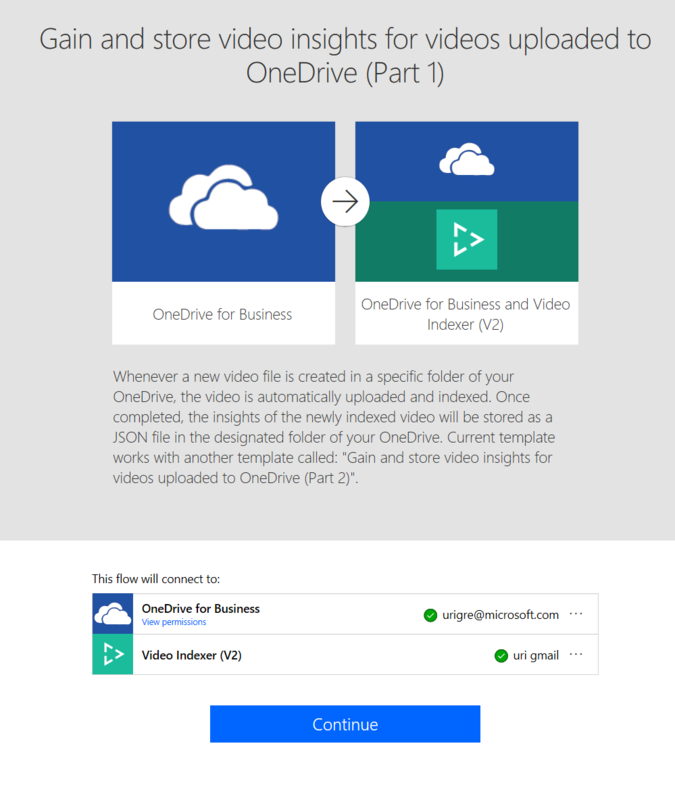 Try out your newly created flow by adding a video to your OneDrive folder, and go back a few minutes later to see that the insights appear in the destination folder. And this is just one example! You can use the new connector for any API call provided by Video Indexer. to upload and retrieve insights, translate the results, get delightful embeddable widgets and even customize your models. Additionally, you can choose to trigger those actions based on different sources like updates to file repositories or emails sent, and to have the results update to our relevant infrastructure or application, or even to generate any number of action items. And you can do all that for large number of files and without coding or having to do a repetitive manual work. Go ahead and try it now for any flow that works for your business needs, it's easy. Use our UserVoice to help us prioritize features, or email VISupport@Microsoft.com for any question.